Goa is a small state which is located in the southwest part of India. Goa capital city is Panaji. The largest city of Goa is Vasco da Gama. The state shares its national boundaries with Karnataka & Maharashtra. There are various famous colleges which provide education in the field of engineering. Some of the reputed colleges are National Institute of Technology (NIT), Birla Institute of Technology and Science (BITS), etc. As per census 2011, the average literacy rate of this state is 88.70%. 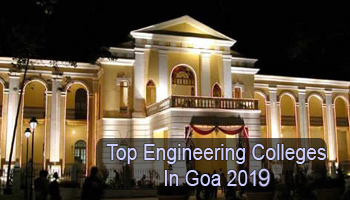 Candidates can check this article to get details about the list of Top Engineering Colleges in Goa 2019. For academic session 2019-20, we have listed the top engineering colleges in Goa. It includes all government & private colleges which imparts 4 years Bachelor of Technology (B.Tech) course. This list helps the candidates to choose the best engineering college for engineering education. Our experts have rated all the listed institutions/colleges after a deep research & survey. The rating procedure has been done on the basis of academic excellence, placement services provided by the college, popularity of institutions between the students, education quality, college infrastructure, national importance, etc. Candidates, those wishing to join B.Tech programme in Goa state, they will have to appear in national & state level entrance test. These tests are JEE Main (national level) & GCET (state level). Some private universities will also organize its own admission test for admission to the engineering courses such as BITSAT, etc. For admission to the M.Tech course, candidates will also apply for the GATE exam. Candidates have an option to choose engineering specializations as per their preferences. There are many disciplines which are offered in the area of engineering. The most famous specializations are Information Technology, Mechanical Engineering, Computer Science & Engineering, Marine Engineering, Civil Engineering, Electrical & Electronics Engineering, Electronics & Communication Engineering, etc. If you have any other query about Top Engineering Colleges in Goa 2019, you can leave your comments in the comment box.